Idaho is a state in the north west part of the US, bordering Canada. It's state nickname is the Gem State because almost every kind of gem like diamonds or rubies have been found in Idaho. It's motto is Esto perpetua, which is Latin for Let it be forever. 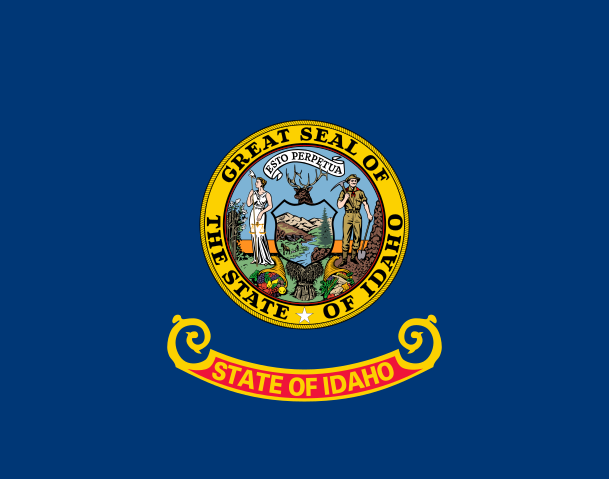 The flag of Idaho has the state seal on it, which shows a woman for equality, liberty and justice. There is a man who is dressed as a miner to show that there is a lot of mining in Idaho. It also has pictures of farming, animals and rivers. There is a large waterfall in Idaho called Shoshone Falls. One of the main crops that comes from Idaho is the potato. There is even a museum for the potato, called the Idaho Potato Museum.